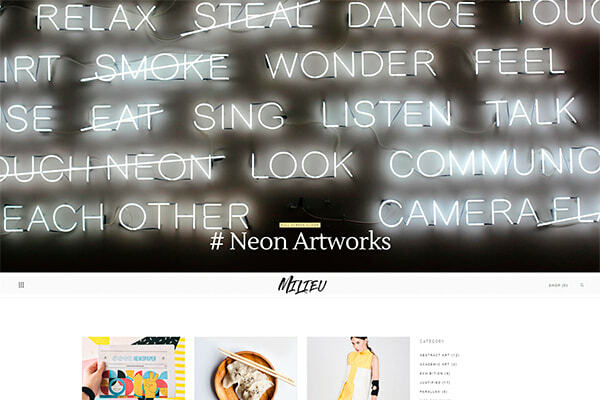 Today we present you another beautiful collection of WordPress themes devoted to blog and magazine websites. 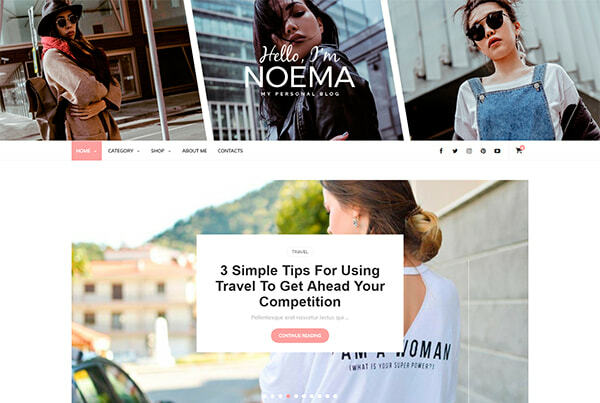 you’ll find the best designs for personal blogs, fashion blogs, news websites and travel online magazines. All of them come with a great amount of features, a set of integrated premium plugins, a bunch of pre-made blog page layouts, and many more advantages. A WordPress blog theme with interesting and modern design. 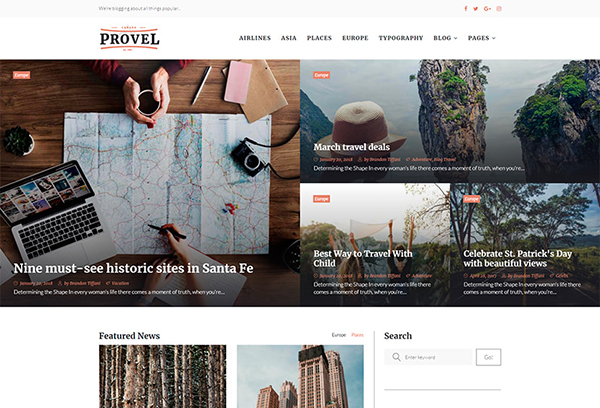 This theme will be a smart and successful choice for travel agency or travel blogger. 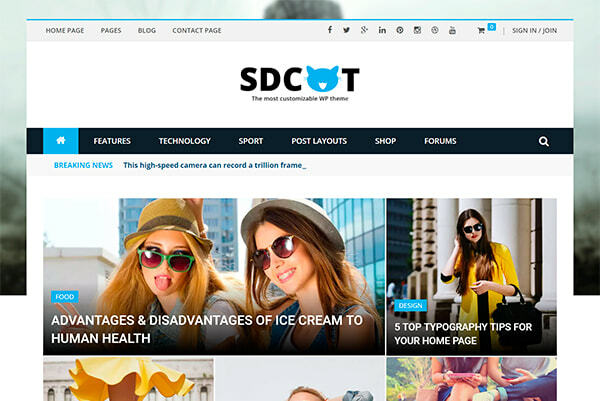 The theme’s features include advanced theme options panel, unlimited sidebar variations, different post formats, responsive design, and many more advantages. A modern WordPress theme created for those who want to write articles and blog posts with ease. It is excellent for news, newspaper, magazine, lifestyle or review site. The template supports videos from YouTube, Vimeo and features a rating system. It uses the best clean SEO practices, it’s fast, simple, and easy to use. A lifestyle, magazine and blog WordPress theme with a specific & beautiful design style. You can show off your articles using 5 featured post options in the theme. It comes with gray and sepia color skins, unlimited color options, a number of single posts, WooCommerce support, and many more features. A clean, unique and very creative WP theme that focuses on your posts and makes monetizing your blog very easy with a large or small banner advertisement in the header. You can easily display your top categories in the featured area or use the simple blog page as your homepage to display only the latest posts. Huzi puts the power in your hands. 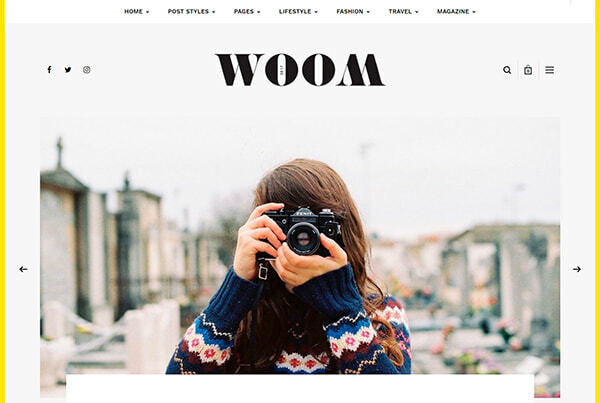 A WordPress theme perfect for any blog or magazine. It has unique design with a lot of options that can help customizing your blog, changing colors, fonts, layouts, post views and more. 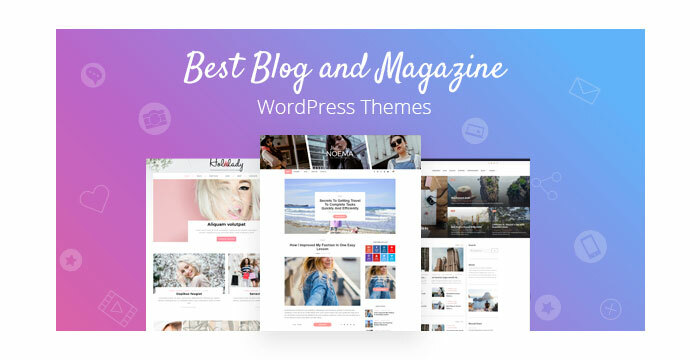 The theme comes with unlimited blog styles and layout combinations, more than 4 featured posts slider layouts, and many more features are available. A news and magazine WordPress theme built around the idea of providing a better reader experience through a clean and simple design. It also brings good experience to the publisher thanks to its easy system of content creation and limitless customizing options. 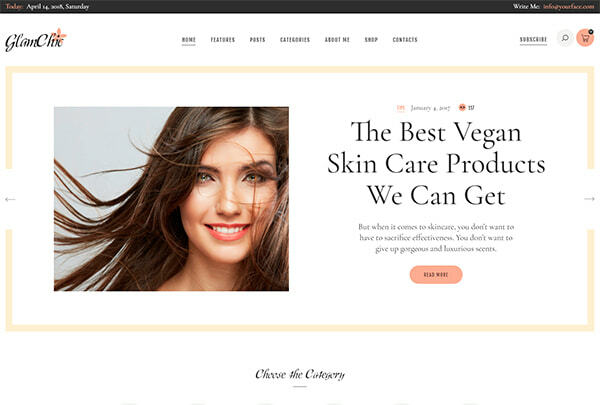 An elegant and high-performance WordPress theme that can be used for a beauty blog, a fashion blog or magazine, cosmetics and skincare online blog, cosmetology website, a lifestyle blog for women, or a general purpose beauty website. WPBakery page builder, Revolution Slider, WooCommerce support, and many more plugins and features are available. A fashion, lifestyle and personal blog WP theme developed for becoming a full-fledged blog for any fashion lovers. It delivers various possibilities which will help you easily create a beautiful, stunning and unique website. It comes loaded with various page types, wide and boxed layouts, includes unlimited color schemes, great amount of fonts, icons and more. 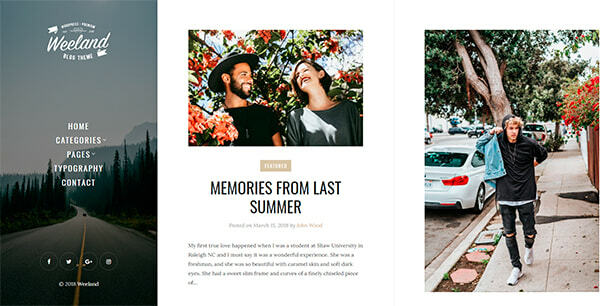 A stylish, elegant and minimal WordPress theme designed for personal blogs. It is a perfect choice for lifestyle, cooking, travel, fashion, art, photography and any other kind of amazing blogs. The theme has several customization options available in the Theme Customizer. It is a multilingual and translation ready one. 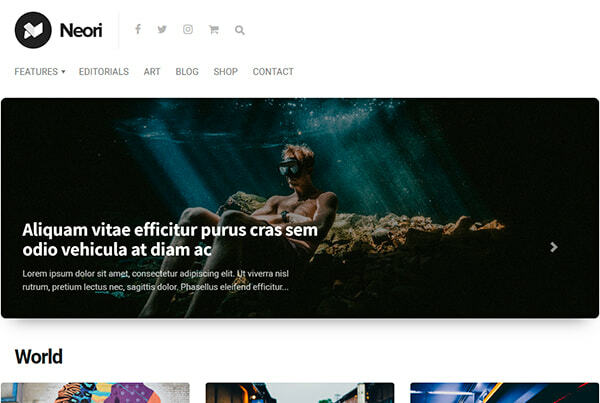 An art, style and culture magazine WordPress theme which is going to become a great tool for creating an online magazine or a blog. The theme comes with 6 modern and completely customizable homepage layouts, loads of pre-made inner pages, unlimited layout combinations, WPBakery page builder, Revolution Slider, 7 distinct post layout shortcodes, and many more features. A powerful WordPress theme which helps you create a new site in a short time using drag & drop intuitive interface. It comes with Slider Revolution, Master Slider and Layer Slider, WPBakery page builder, multiple category mega menu styles, ajax live search, multiple portfolio layouts, and many more features. 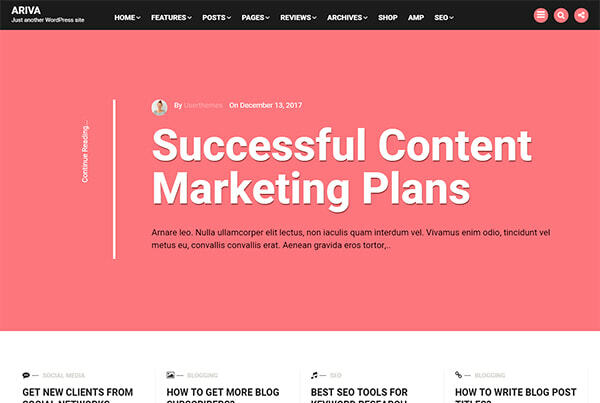 A distinctive blog WP theme with multi-purpose design suitable for most bloggers but particularly suited for food and lifestyle bloggers looking for a unique and exciting blog design. 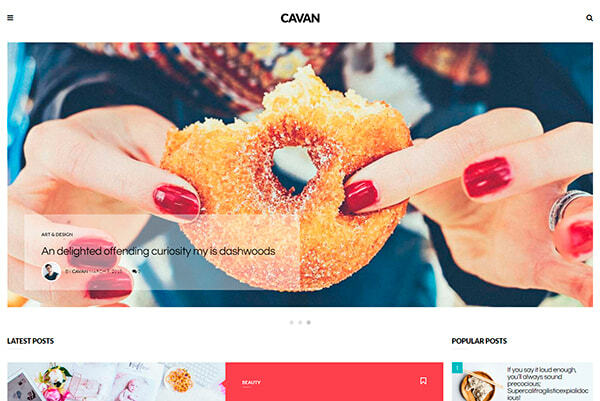 With a choice of post layouts, two fully widgetized sidebars and an eye catching featured slider, and custom widgets; Cavan provides all the elements you need to create a stunning blog. A unique, simple and stylish text-based WordPress theme designed for the dedicated bloggers. It is a perfect SEO-optimized responsive template that has clean code and supports JSON LD & AMP features. You can create a custom design to build your brand using 125+ homepage layouts, 9 attractive featured sections, 6 minimal headers, and 7 engaging post layouts. 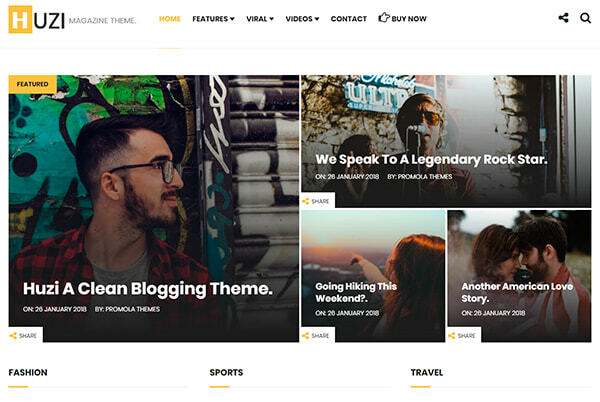 A WordPress theme which makes you a cool blogger. 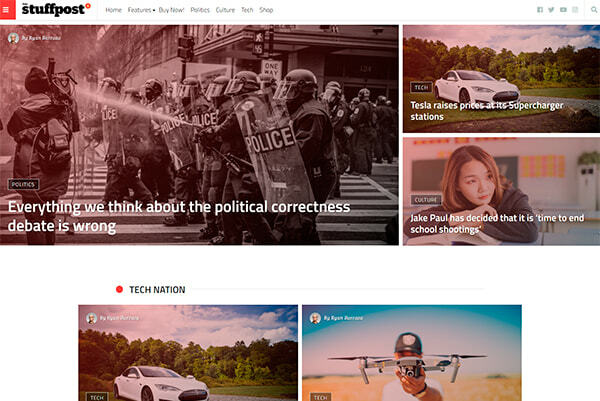 It will allow you to develop a reputation among recognized publishers by a bunch of tools and featured components that allow to create the most professional and modern online news magazine on the Web. 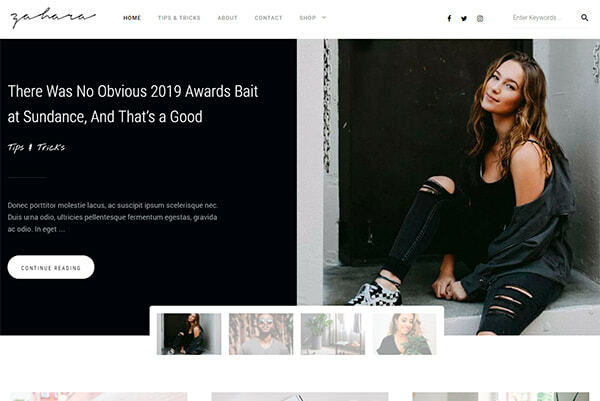 The theme comes with 7+ different homepage layouts, 6+ article layouts, 10+ responsive banner sections, a sticky sidebar, 2+ menu layouts, WooCommerce support, and many more features. 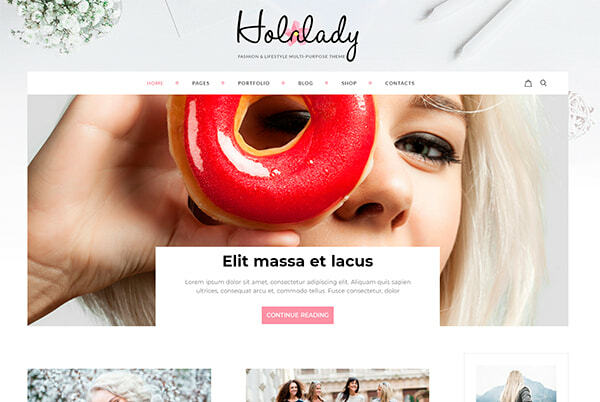 A creative WordPress blog theme which comes with elegant and carefully crafted design. It comes with 4 different featured post sliders and 4 post layouts, 5 custom widgets, sidebar options, Contact Form 7 support, font style editor, translation ready compatibility, Mailchimp integration, sidebar options, and many more features.